This colourful stir fry was a lunch I threw together recently in an attempt to find a different way to use up some leftover 'Rosso' tofu from Taifun which is flavoured with tomato, olives, garlic, paprika herbs and chili. Although the Mediterranean flavours are not what you would expect to find in a stir fry, paired with rice noodles, peppers, cabbage and spring onions this turned out to be a really tasty lunch! Before I gave up dairy I used to eat a lot of coleslaw but I hadn't thought much about it in the last year or so until I recently got my hands on a jar of Vegenaise. To make this dairy-free coleslaw I simply combined red cabbage, carrot and apple with the Vegenaise and I'm pleased to report that the result takes just like the real thing. I'll probably be eating more coleslaw again in future! With the cold weather well and truly setting in over the last month, I picked myself up a large stainless steel pot from Ikea and have been experimenting with variations of vegetable stews. This particular version combines sweet potato, cabbage, onion, garlic, carrot, romanesco broccoli, butterbeans and sweetcorn. To make the stew I simply sautéed and seasoned the chopped vegetables, then added in a mix of vegetable stock and caramelised onion gravy granules along with the butterbeans and sweetcorn and pretty much left to simmer until the vegetables were softened. To thicken the stew I like to mash the potatoes slightly with a fork a short while before serving. I've also been enjoying making variations of vegan/gluten-free dumplings to add to the stews by adapting a recipe from Delights & Delectables. Another product I picked up from the Taifun range was the Tofu Basilico flavoured with basil, wild garlic and parsley. For this simple pasta dish I was inspired by the classic flavours of a Caprese salad, using tomatoes, a dairy-free soft cheese and the tofu in place of basil. To coat the pasta I also threw together a simple sauce using tomato paste, olive oil, boiling water, garlic granules and black pepper. I think some chili flakes would also be a great addition to this sauce! 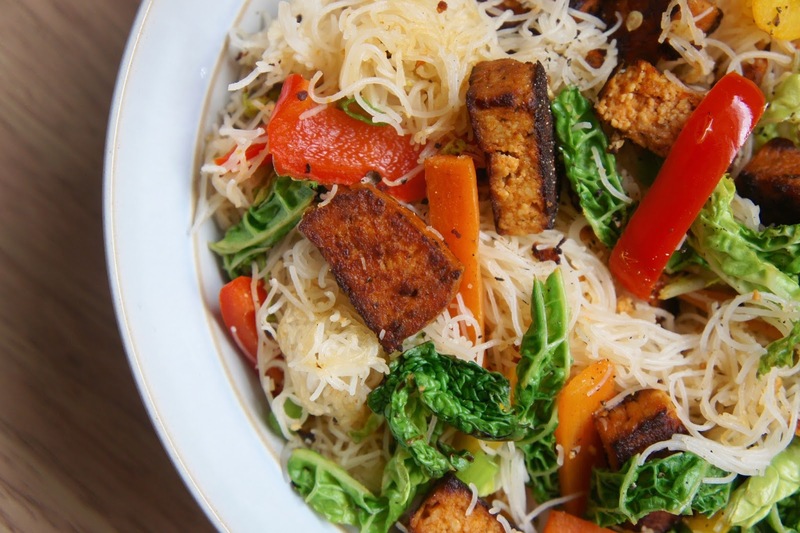 If you ever have any leftover tofu to use up this is a great go-to recipe idea. There are lots of variations out there to experiment with but this one from Happy Healing is a great place to start. Although you could add it to other dishes I think popcorn tofu is best served hot with your favourite dipping sauce for a tasty snack! If you missed my previous Cooking Lately posts you can catch them here.